Caramel is a candy created when sugar is heated to 170 degrees Celsius (340 degrees Fahrenheit). When sugar is heated slowly to this point, the molecules break down and form new compounds that have a deep, rich flavor and dark golden brown color. This process is known as "caramelization" and can be achieved with any variety of sugar. Caramel can be eaten alone as a candy or used to flavor other candies, desserts, or beverages. A layer of caramel is used to top the classic desserts flan and creme brûlée. Caramel is the binding agent for several candies such as pralines, caramel corn, and peanut brittle. When it only contains caramelized water and sugar as it does for these desserts, it is known as clear caramel. Caramel can be mixed with cream and other ingredients to make caramel sauce or soft caramel candy, such as milk caramels. Caramel-coated apples are a popular autumn treat. A pinch of salt is used in most caramels because it helps counter the bitterness that develops during caramelization. Adding more salt to make salted caramel is a popular variation, with salt either added to the top of candies or mixed with caramel sauce. Caramel-flavored coffees and hot cocoas are also common, and their salted caramel variations also have become popular. There are two methods for making caramel—dry or wet. Dry caramel is made simply by heating sugar until it liquefies. Wet caramel is made by combining sugar with water before heating to the point of caramelization. Whichever method used, the sugar must be stirred constantly to prevent hot spots that can quickly pass the point of caramelization and end up burned. Making caramel at home can be tricky because of the narrow temperature range in which sugar becomes caramel before it burns. Other ingredients, such as butter, milk, or vanilla, can be added to caramel for more flavor and texture. These ingredients are usually added after the sugar has caramelized. When milk or butter is added before heating the sugar, the milk sugars themselves can caramelize, producing a slightly different flavor and texture. Adding milk or butter helps achieve the chewy caramel texture, as opposed to a hard candy. Homemade Caramel Sauce Recipe: In this recipe, sugar and water are cooked to a golden brown color, then butter and milk are added. Sea Salt Caramels Recipe: Sugar and corn syrup are caramelized, then blended with heavy cream, butter, and sea salt to make this treat. They can be enjoyed plain or you can add a dark chocolate coating. 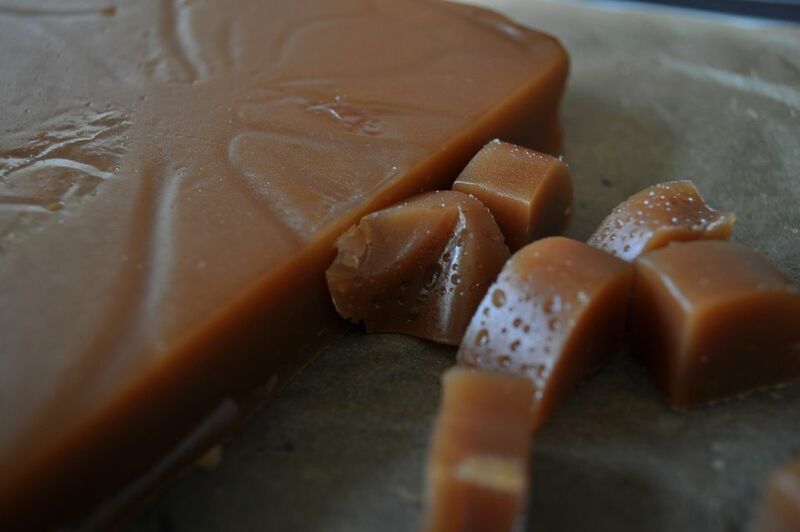 Toffee and butterscotch are similar to caramel but are made with brown sugar or molasses and have butter added. Butterscotch is boiled to the soft crack stage. Toffee is heated further to the hard crack stage. Caramel color is a compound used for coloring foods, most notably colas. This highly concentrated product is nearly 100 percent caramelized sugar and has a strong, bitter flavor. This product is used in small quantities and only for color, rather than flavor.